This is a tale of obsession. Several years ago my wife called me a “documentarian.” It took a while for me to process that because it’s not a word I had ever used to describe myself, but eventually I realized it’s totally accurate. And nowhere does that part of me manifest itself more than in the annual reports I've been making since we were married. We call it the Jamesonian. It started as an extensive eight-page (8.5" x 11") year-end newsletter. 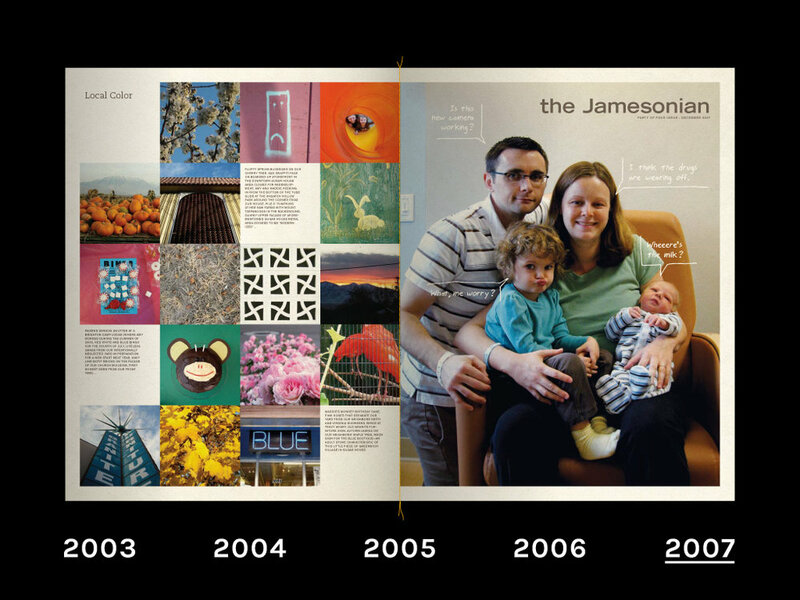 At the heart of each issue was a month-by-month timeline full of visual artifacts accompanied by written descriptions of what we did that year. Each edition was printed on two kinds of paper with color and black & white printers, hand-sewn along the spine, and shipped in heavy stay-flat mailers. We used this format for five years, but the content length and production costs limited who we could send it to. For a couple of years I shrunk the format to 5" x 7", which simplified the content and reduced materials, but it still took about as much effort to produce as the larger version. For the 2010 issue I switched to a simple folded card that we have printed professionally. No more fussing with office printers to align back-to-back pages and sewing sheets together. And no more limits on quantities. But more importantly, changing the format gave me a blank slate. Every issue since then has its own look. The first couple of cards basically delivered the same kind of information with different art, but by 2012 I started to play with the structure of the information. Then I rethought the content altogether. Inspired by Nicholas Felton’s data-driven personal annual reports, I collected household data throughout 2013 and presented the highlights as an infographic in that year’s report. (You can see a sketchbook that gives a peek into the process of making that issue here.) Since then I’ve found a different conceptual lens for each issue. For 2014 I photographed a neatly organized collection of objects representing key events. We used our own words against us in 2015. And for 2016, we described the year in terms of things we’ve made. From the beginning, the Jamesonian has been fueled by my idiosyncratic interests—the same things that most of my personal work revolves around—and it’s most satisfying to me when it tackles some sort of creative objective in addition to doing the job of reporting on our year. This puts more pressure on the project, but it's also what makes it worth doing at all.